On August 28, 1963—the day of Martin Luther King Jr.'s famous "I Have a Dream" speech—segregation ended finally at Baltimore's Gwynn Oak Amusement Park, after nearly a decade of bitter protests. Eleven-month-old Sharon Langley was the first African American child to go on a ride there that day, taking a spin on the park's merry-go-round, which since 1981 has been located on the National Mall in front of the Smithsonian Institution in Washington, D.C. 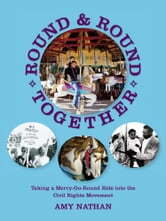 Round and Round Togetherweaves the story of the struggle to integrate that Baltimore amusement park into the story of the civil rights movement as a whole. Amy Nathan is an award-winning author of several books for young people, including The Young Musician's Survival Guide, Count on Us: American Women in the Military, Yankee Doodle Gals: Women Pilots of World War II, Meet the Musicians, and Surviving Homework. She grew up in Baltimore and went to Western High School.